Oak Leaf measures 8.5 mm by 19 mm. Earring dangles aproximately 20 mm below leverback. Upper Edelweiss link is aproximately 10 mm wide and 15.5 mm tall. Lower Edelweiss link is aproximately 12 mm wide and 17.5 mm tall. Earing Dangles aproximately 34.5 mm below leverback..
Lower Edelweiss link is aproximately 15 mm wide and 20.5 mm tall. Earing Dangles aproximately 37 mm below leverback..
Each Edelweiss link is aproximately 10 mm wide and 15.5 mm tall. 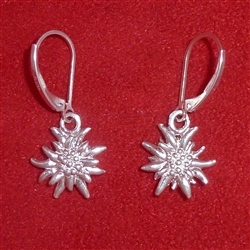 Earing Dangles aproximately 33 mm below leverback..
Each Edelweiss link is aproximately 15 mm wide and 20.5 mm tall. Earing Dangles aproximately 42 mm below leverback..
Upper Edelweiss link is aproximately 12 mm wide and 17.5 mm tall. 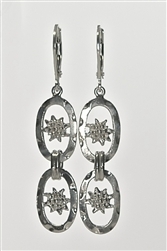 Earing Dangles aproximately 39 mm below leverback..
Each Edelweiss link is aproximately 12 mm wide and 17.5 mm tall. Earing Dangles aproximately 36 mm below leverback..